It's Hayao Miyazaki's 75th birthday today so I just had to make a post in celebration because I am very happy he was born! He has brought us many great films, one of them being my favorite of all time, Totoro! 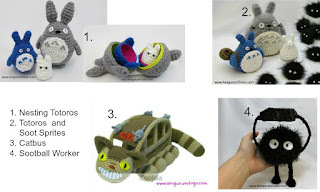 I have a few Totoro inspired patterns here on my blog. Hope you enjoy. I also made my first stop animation film using my Totoros called "No Room On The Bus". It's choppy but still kind of cute. 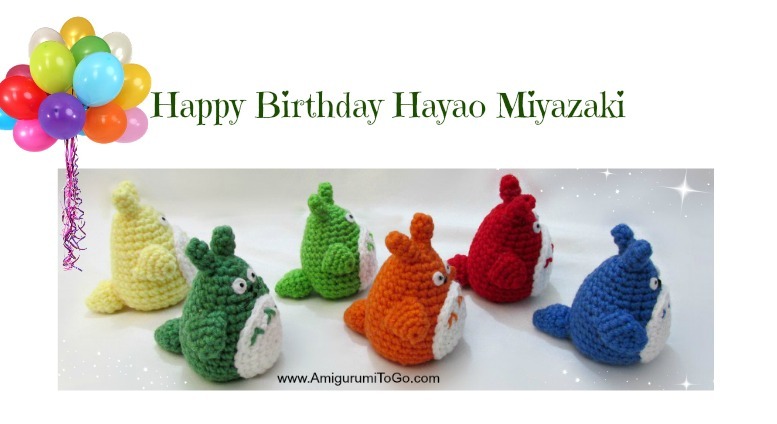 This attention to Hayao Miyazaki and his birthday is great. I love his and your work a lot. These special amigurumi are funny and let people smile. You are an amazing talent. I'm so happy I found your blog and you tube channel. Since Wednesday I've made two bears and have started mouse! Thank you for posting so many wonderful videos and tutorials. Hi Sharon! I absolutely love your work and I started to crochet following your videos! I m contacting you because there is an Italian Youtube Channel who translated your tutorials and did't mention you at all. I said her it was copyright infringment and she wasn't authorized to publish that tutorial. She answer me she didn't know that, and few seconds ago my comment disappeared and she wrote in the description box that it was your pattern and you authorized her to make the tutorial in Italian. I just want to be sure that's the truth because I absolutely hate dishonest people. I hope you'll answer me. Have a nice day, Flavia. Hello there! I thank you very much for the message. I actually do know about that tutorial and she did contact me and ask but it's a shame that she didn't mention where the pattern came from in the video. That makes me a little sad as it's so easy to say "I'm translating this with permission" but I did give her permission to do that. I did ask her to provide a link back to the original. I'll go check it out today and see if she provided that much at least. On a side note, I love it when my patterns are translated, nothing makes me happier!